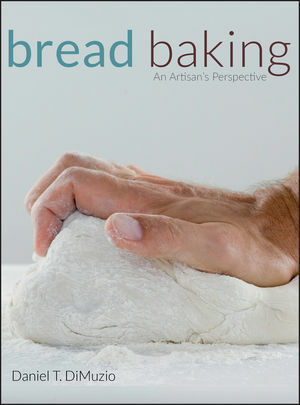 A guide to making artisan breads practically and profitably, Bread Baking: An Artisan's Perspective includes step-by-step instructions on mixing, fermentation, shaping, proofing and retarding, and baking. Written for both experienced and novice bakers, Bread Baking contains more than 150 helpful photos and drawings that illustrate techniques and showcase beautiful artisan bread products. Covering the business of bread-making, this book features practical advice from successful artisan bakers as well as forty plus tested artisan bread formulas, including ciabatta, pain au levain, bagels, honey whole wheat, croissants, and many more. Artisan bread baker and teacher Dan DiMuzio provides invaluable information on troubleshooting, ingredients, laminated dough, and creating dough formulas. Professional bakers and baking and pastry students will benefit from this practical resource to artisan breads. Daniel T. DiMuzio is formerly a baker and a bakery consultant, and is currently Chef Instructor at Culinard, The Culinary Institute of Virginia College. DiMuzio teaches a number of courses in the Baking and Pastry curriculum, including Artisan Bread, Essentials of Bread Baking, Introductory Pastry Skills, and Baking Science. He is a member of the Bread Baker's Guild of America, and has studied with such bread baking luminaries as Michel Suas, Didier Rosada, Jeffrey Hamelman, and Lionel Vatinet. 1 The History of Bread Making. A Brief History of Bread Making. Bread’s Impact on Basic Survival. World War II and Its Aftermath. Rescue Arrives —The Improved Mix Method. Renewed Interest in Great Bread. 2 Ingredients and Their Effects. The Most Important Ingredient: Flour. Nuts, Seeds, Grains, and Dried Fruits. 3 Basic Baker’s Percentage (Baker’s Math). An International Language for Bakers. Find the Total Flour Weight: Using the Percentage Sum. When You Have Two or More Flours. The First 10,000 Years: Hand Mixing. Two Stages in the Dough Mixing Process. Mechanization Arrives: The Short Mix Method. Is There a Best Mixing Method? Fermentation: A Process of Transformation. Does Fermentation Create or Destroy? Yeast Fermentation: Produces Carbon Dioxide and Alcohol. Bacterial Fermentation: Produces Organic Acids. Nonliving Organic Substances: Esters and Enzymes. Manipulating Fermentation: Time, Temperature, and Hydration. Pre-Ferments: How to Shorten Fermentation Time While Increasing Strength and Flavor. 6 Division and Shaping of Loaves and Rolls. Judging the Readiness of Proofed Loaves. Proofi ng versus Bulk Fermentation. Gas Production in Successful Proofing. Changing the Temperature of Dough. The Degradation of Dough Structure. Specialized Equipment for Proofing and Retarding Loaves of Bread. Recognizing When Loaves Are Ready to Be Baked. How to Judge the Doneness of Bread. The Importance of Cooling Bread after Baking. 9 Rich and Laminated Doughs. The Effects Ingredients Have on Dough. Strategies for Turning Lean Dough into Rich Dough. Why Not Just Add the Fat to the Dough? Differences between Croissant Dough and Danish Dough. Some Caveats in Working with Laminated Dough Products. Formulation: How Can We Design Our Own Reliable Bread Dough? Create a Formula, Not Just a Recipe. Advanced Topic #1: Flour Composition and Milling Technology. Elements of the Wheat Endosperm. Advanced Topic #2: Advanced Baker’s Percentage. Using Pre-Ferments in Formula Creation. Which Pre-Ferment Should You Use? Advanced Topic #3: Controlling Fermentation: Living and Nonliving Players. Advanced Topic #4: Decorative Dough Pieces.